Will Green Light Therapy Sunbeds Be Mandatory For European Indoor Tanning? The rumor about what will be in the new regulations for commercial indoor tanning within the European Community was leaked today, April 1st, from the working group in Brussels. One of the most revolutionary and interesting novelties in the new European sunbed rules is said to be a mandatory provision for tanning salons to provide a session in a sunbed with green light lamps directly after the ordinary UV-tanning session. The time spent in the green light sunbed must be as long as the session time in the UV-tanning bed. According to representatives from the Associated Pan-European Regulatory Information League and Federal Organisation Of Light-therapy1), it has been proved in a study from 1995 by Saeeduddin Ahmed et. al. “Phase Response Curve of Low-Intensity Green Light in Winter Depressives”, that the melanin-reduction from green light will compensate for the melanin-production during the ordinary tanning session and thus eliminate the risks perversely associated with indoor tanning. Professor Adam Green from IARC (the Irish Agency for Rejuvenating Colors) confirms that a secret trial recently conducted in Dublin proves that even wearing green colors will drastically reduce any brown pigmentation. “We measured the face-color of as many as 1011 people on the morning of March 17th 2013 and again 24 hours later. It turned out that 1001 of the participants had lost almost all colors they had from beginning and that their faces had become very pale with a distinct shade of green“, explains Prof Green. All of those who lost their pigmentation confirmed having been wearing both green hats and green scarves most of the 24 hours the study lasted. Here is a picture of one of the participants taken just a couple of hours into the study. Professor Green admits that green beer might have been a confounding factor in the study. In the video below, you can see some of the cows participating in the Canadian study and also notice that the mooing from cows with darker hides is a little bit deeper than from those with less pigmentation. Fast reaction from European sunbed manufacturers. Some European manufacturers of sunbeds have been quick to react to the leaked rumors and have already solutions ready that might satisfy the regulatory authorities. For The Tanning Guru, this sounds like an ideal model for those who want to use sunbeds to get their vitamin D but not to get a tan. When it comes to the rejuvenating effects from different colors an interesting observation has been made in Moscow, Russia, where the old-fashioned traffic-lights are being replaced by modern LED lights. 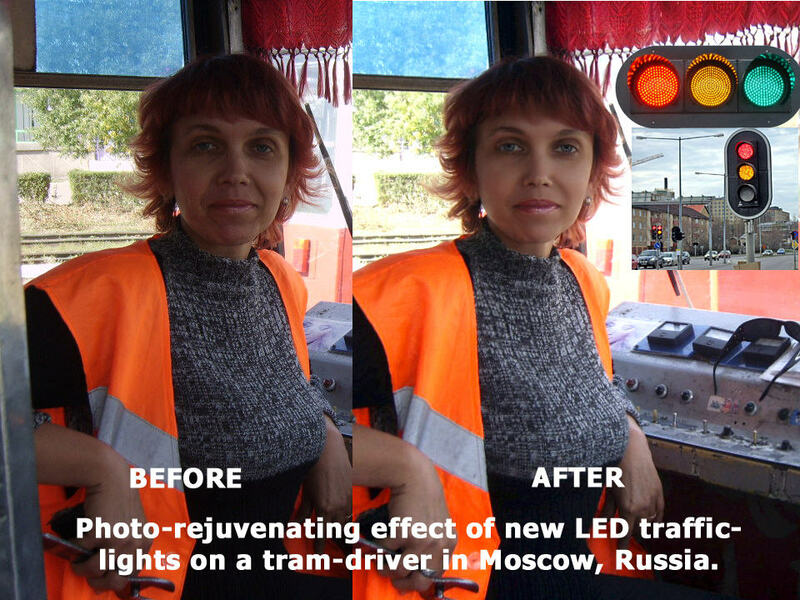 In the image below, you can see the effect in the face of tram-driver Svetlana Tsvetafora. “Even my husband, who normally don’t take much notice, yesterday asked me if I had been “spending money on my face”, said Svetlana to The Tanning Blog. PrevPreviousJust How Close Are The MEPs in MAC To A Large Cosmetic Manufacturer? 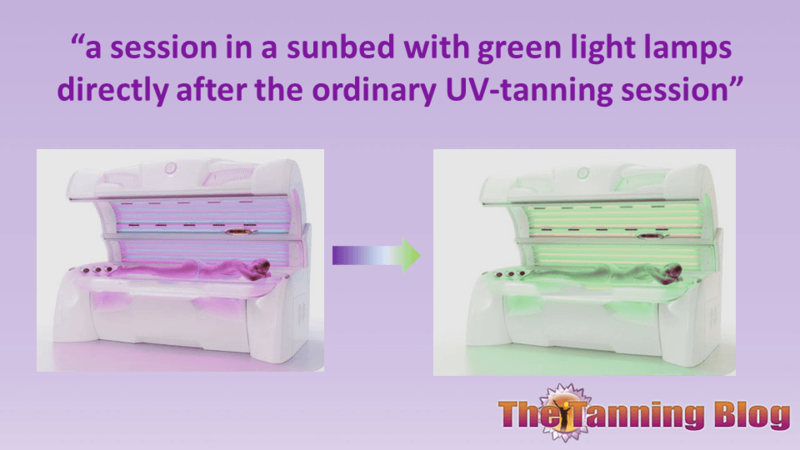 This is interesting, but would green be a superior way to tan over typical tanning bed bulbs? very good and nice blog. this is the great post about green light for European indoor training. looking forward to more posts like this. thank you. woo, This is a informative about Green Light Therapy. it grow my knowledge.